GSD jobs are what this dog breed desperately craves. The German Shepherd is the most versatile breed of working dog in the world. Highly adaptable, task-oriented, naturally protective, the German Shepherd is a dog suited to working with people. 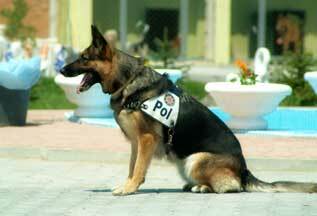 Overall, this breed can do it all, German Shepherd jobs and training are what the breed enjoys. The German Shepherd is a working dog breed that can easily switch gears - from bite work one minute, to being around kids the next. The German Shepherd is a wonderful all-around dog, very in-tune to their master, possessing the ability to easily change jobs from one to the other with no lapses or bumps in the gear changing process. Without question, temperament is key in the German Shepherd Dog - and even more importantly in a working GSD. It's intelligence and temperament are legendary and have gained it a loving fan club all over the world. Working dog roots can be traced all the way back to the breeds inception in 1899 per the visionary dreams, planning and management by breed founder, Max von Stephanitz. The keen intelligence and trainability of the breed have made the GSD the most versatile breed of working dog in the world. In addition to their traditional jobs of herding, and later of police and military type work, this breed excels at rescue, tracking, obedience, agility, scent discrimination, all types of service work and as a home sentry. I have even been told of owners who hunt with their German Shepherds, not an activity that most people would connect to this breed, but who swore to me that their German Shepherds did a great job out in the field. This mastery of the complexities of change is exactly what the German Shepherd is built for. Being able to go from herding the livestock, to patrolling the streets, to running an agility course, to sleeping by the side of it's handler during daily functions is exactly what the German Shepherd is best at. Above all, the German Shepherd should be a family dog first, and a working dog second but GSD jobs are what the breed craves. When consistent training is done there is little that the German Shepherd can't learn. Training based on the GSD's natural play and prey drives works well, as well as training based on the ability to search and find objects. Training methods and motivating factors can vary from dog to dog so it is important to find what works for your individual dog. Train frequently, work daily and you'll find that you have a much happier dog in your family. It is all these traits and more that make the German Shepherd Dog so honored and wanted throughout the world. These traits can also make the owner's life of this breed difficult, especially if the German Shepherd jobs needs are not fulfilled regularly. In other words, your German Shepherd needs something to do, and desperately needs to have a purpose. I always tell my puppy buyers and other dog owners alike to be sure and find your GSD jobs to do or it will find one on it's own. And you will probably not like the job it chooses for itself. To maintain your sanity, and that of your family, please find an activity or a few GSD jobs for your dog to perform regularly. Below you will find links with more detailed information for several GSD jobs and working dog activities that the German Shepherd excels in and many in which you and you dog may participate. 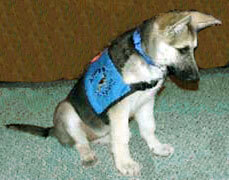 Activities, such as the sporting events of Agility and Schutzhund and others, are all discussed on the training page. GSD Jobs, the versatility of the German Shepherd, their willingness to please and their innate working ability are all showcased in the jobs listed below.